Romaine lettuce is an unusually versatile salad ingredient. It combines the dark color and nutritional value of leafy lettuces with the crisp, juicy texture of head-type lettuces such as iceberg, giving it the best attributes of each type of lettuce. 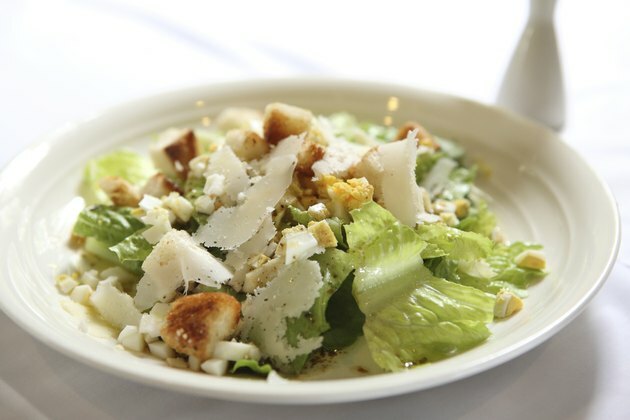 Romaine hearts are especially popular with home salad makers. These are full heads of romaine that have been stripped of their relatively coarse outer leaves, which are often damaged during harvesting. The delicate inner leaves are pre-washed to remove grit and dirt, and need only rinsing before they are cut and used in salads. Rinse the romaine thoroughly under cold running water, separating the leaves gently with your fingers to allow the water to flow through. Shake off any excess moisture, and lay the romaine hearts on your cutting board. Using a sharp knife, trim away the dried layer at the root end of the heart. Leave enough of the root end to hold the leaves together. Cut the romaine heart into four wedges, lengthwise. Turn them cut side down on paper towels and allow them to drain for five minutes before proceeding to use the wedges in your salad. Separate the romaine leaves and rinse them well under cold running water. Shake off any excess, then spin the leaves in a salad spinner or pat them dry with paper towels. Gather the leaves back up into a loose bundle. Cut through the whole bundle lengthwise, then turn it and cut again so the whole bundle makes four loose wedges. Cut across the leaves at one-inch or two-inch intervals, making rectangular bite-sized pieces. Toss the pieces with other vegetables to make a green salad. Separate the leaves and rinse them well under cold running water. Spin them in a salad spinner, or dry the leaves manually on clean paper towels. Pick three of the largest leaves, and lay them out on your cutting board. Stack additional leaves on top of each, working from the largest available to the smallest. Roll the first stack of leaves into a tight, cigar-shaped bundle. Using a sharp knife, cut across the "cigar" to make fine shreds of lettuce. Repeat, with the other two bundles. Toss the fine shreds of romaine to loosen them, and use the shredded lettuce as directed in your recipe. There is a persistent myth that cutting lettuce with a metal knife causes it to brown more rapidly. In truth, food science writers such as Mark Scarborough and Bruce Weinstein have demonstrated that lettuce browns at the same rate, whether it is cut with metal, cut with a plastic "lettuce knife," or torn. The chiffonade technique can also be used for flat leafy herbs, such as basil.